Zu Warriors is a straight-to-video release, at least here in the U.S. That was the first bad sign, and I should have paid more attention. Instead, I was wowed by the impressive pedigree of talent it boasts: Tsui Hark directs; Yuen Wo-Ping provides the choreography; Zhang Ziyi and Sammo Hung have small roles in the film as well. And, if that weren’t enough, the movie has some astounding computer-generated special effects that are so well polished they’re slick. All of which goes to show just how important a good script is. 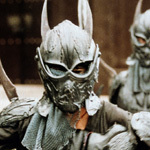 Zu Warriors is so convoluted, with such little regard for character or motive that it’s a wonder I stayed awake for the whole thing, in spite of the star power and slick effects. The plot is the Chinese equivalent of an Olympian power play, with a Chinese Zeus, Vulcan, and Athena meddling in the affairs of mortals. The problem is not so much that you can’t tell what’s happening, as you can’t understand why these characters — immortal or otherwise — are doing what they do. If they don’t care what their motivation is, why should we? The list of talent involved only makes the movie more disappointing, while the computer-generated special effects are no more interesting than the “visualizer” setting on iTunes. Only for one brief scene did I sit up and take notice. It’s an honest-to-goodness swordfight, toward the end of the picture, with only a minimal amount of computer fakery. It’s the only scene in the whole film that relies more on talent, choreography, acting, and grace, than on some computer-generated nonsense. Miramax was right to shuffle Zu Warriors off to the DVD wasteland.